As part of our Viking Sports Mission Statement and Values, we believe in fostering a healthy lifestyle for children and adults of all ages and abilities. While inclusion has always been a part of our programs, Viking Sports is stepping up to the plate now more than ever to meet the needs of our friends and neighbors with disabilities and special needs. Our coaching staff is well-trained on sensitivity to diverse populations and working with children and adults with disabilities in order to emphasize and build upon this important part of our Viking community. 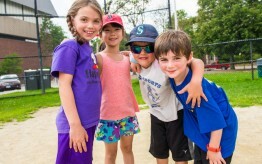 We use our registration forms and email system to encourage parents to consult with us prior to placing their child in any of our programs about the ways in which Viking Sports can provide our services based on physical activity and fun for all. This is something that we would like to make sure all of our parents are aware of here in the Viking Sports Community. Regardless of any legal matters or official diagnoses, we want to know how your child functions best and how we can cater our programs to meet individual needs. At Viking Sports, we pride ourselves not just on providing expert standardized sports programming. We are also willing to provide the support above and beyond any boundaries that standardization may pose to an atmosphere that brings the most joy and social connection to our members. Every individual is important, and we want our community members to know how much we take this to heart in our programs. Please feel free to email us or call us to talk more about the subject. While we do our best to reach out to more and more people, we also hope that our current community members will pass this information along to their friends and neighbors who may have barriers to participating in group fitness. If a child’s parent expresses a need for a one-on-one coach, we have quality coaches here at Viking Sports with experience working with children of all abilities who are prepared to build that into our programs more than ever before. Viking Sports provides equal opportunity to children with able bodies just as much as we do for children with physical or intellectual disabilities.